Perryfield roach has a very open textured and is seen as a shelly stone. Often used as a feature course or where a building requires a lot of character. The most durable of the Portland stone range, we find it is often used for sea defence work or cladding for very heavily exposed areas. Due to its high shell content it cannot be easily carved and is more suited to ashlar panels or band courses. We have extensive stocks of this stone with blocks typically from 1 tonne upwards to 12 tonnes. 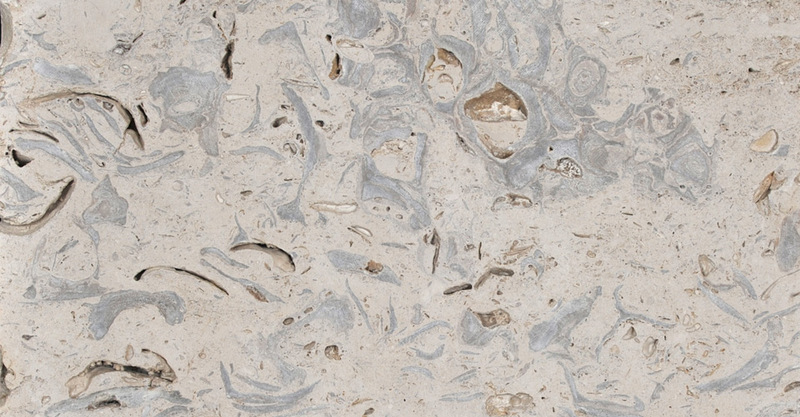 Portland oolitic limestone principally formed from micritic ooids in a sparse micritic matrix, the stone contains high quantities of shell fragments in the size range 5mm to 40mm. Some compaction of the ooids is present but the matrix exhibits a high intergranular porosity with interlinking of pores. No clay or other minerals are apparent. Perryfield roach is known to be a very durable building stone and has been used extensively within the United Kingdom. It has good resistance to salt crystallisation. Historic use indicates that it is capable of service life well in excess of 60 years providing that high concentrations of sulphuric dioxide are not present, and that good stone detailing methods are employed to give best protection from surface water ingress. Roach has an open texture with voids, and is not suitable for flooring. It has the potential to be filled and spun off however, we do not provide this service. Overall, should be suitable for use in most aspects of construction but mainly load bearing masonry and cladding, including areas where a long service life is needed or where high salt concentrations are expected.